I've been playing around a little bit with Visual Novel Maker, the upcoming "Maker" software from the same publishers as the RPG Maker series. I'm not going to run a full review on it just yet (it releases on the 16th of the month), but I wanted to drop down some early impressions, because this software is the real deal, and you should be getting excited for it, if you've ever wanted to create a visual novel - or game - of your own. 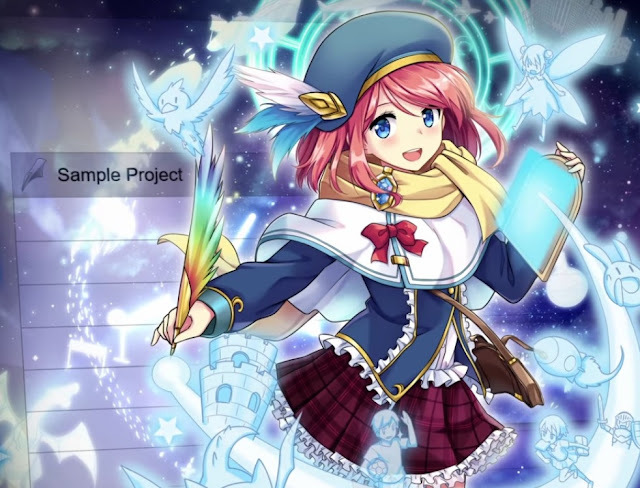 Related reading: Our interview with the creator of the Visual Novel Maker software. Just like the RPG Maker series, Visual Novel Maker's principle goal is to give people the ability to make a visual novel, even if they have absolutely no skill in game design whatsoever. The difference, however, is that with the RPG Maker games, the best result you can hope for is a 16-bit style JRPG that people would instantly recognise as "an RPG Maker game." That's not to say you couldn't create something very worthwhile in it, but it would be impossible to recreate some of the more high profile JRPGs in RPG Maker. Take Persona 5, for example. You couldn't create Persona 5 in RPG Maker. On the other hand, if you wanted to create Steins;Gate, Hakuouki, Fate/Stay Night, or any other "top tier" visual novel, you could do that with Visual Novel Maker, and do so with relative ease. All the tools for those straightforward visual novels that don't feature gameplay gimmicks (like something like Danganronpa does) are right there from the outset, and accessible to anyone who has the focus and time to learn their way around the software's UI. All you need is the art assets, and the ability to write. Both of those things are incredibly difficult skills to master, of course, but at least you don't need to throw coding into the mix. In other words, you'll be able create commercial-quality visual novels within the software, without having to learn to code. This was the explicit intent of the development team, and I can confirm already that it really is possible. Get someone to draw you up some art (or do it yourself if you've got that talent... I'm bloody jealous of you), get some music together, and the only thing standing between you and replacing Steins;Gate as the greatest visual novel ever made is a stroke of imaginative genius and some brilliant writing. That is, once you've actually come to grips with the software. I'm struggling a little in places at this early stage, unfortunately, and I am trying to do things that should be very basic. 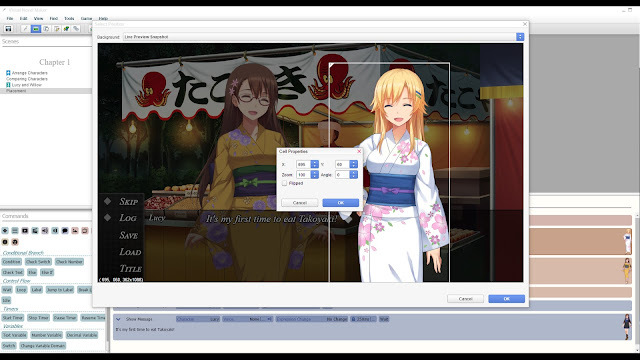 As per the product description, Visual Novel Maker does indeed employ a drag-and-drop interface, and as you come to grips with the UI and feature set, actually navigating around is quite easy, and you can draw up new scenes and get writing very quickly. That's the good, and I was comfortable with that immediately. The problem is that the documentation is generally poor. It's all in English, but could have used a couple of passes with some other editors to iron out the language so that it's clearer and cleaner. And for some things it's just no help at all. For example; I've got some of my own art assets (yes, Dee Dee. I'm looking at making a Dee Dee visual novel). They're in the correct format, and have a transparent background. I follow the steps in the documentation for importing this character asset, but while she shows up in the resource database, I can't figure out how to bring her into the game just yet. I suspect it might be because the file dimensions of the image are too large, or something similar from a technical perspective, and I'm sure I'll figure it out through trial and error at some point, but for now, the lack of clear documentation and troubleshooting help within the software is proving to be frustrating. For most people that level of customisation will be a learning process a bit further down the track, though, and I do have to emphasise that this thing is so, so easy to jump into. The software itself comes with plenty of pre-made (and, obviously, working) assets to get started with; characters, backgrounds, the works. These are actually quite nice in their own right, So while you're learning the basic flow and structure of the software, it will be fun to play around with what's already in there. That "complete package" approach to Visual Novel Maker is a major advantage it has over some of the other visual novel production software packages, which are happy to throw you in the deep end and give you nothing to work with at the start. Another advantage I've already touched on, and it is its ease of use. Despite the difficulties I've had with the documentation, I've been able to figure out all the basics that I need to on the back end to make visual novels work, and do so in the span of a couple of hours (if that). Conversation trees are very easy, and so too are basic statistics tracking. 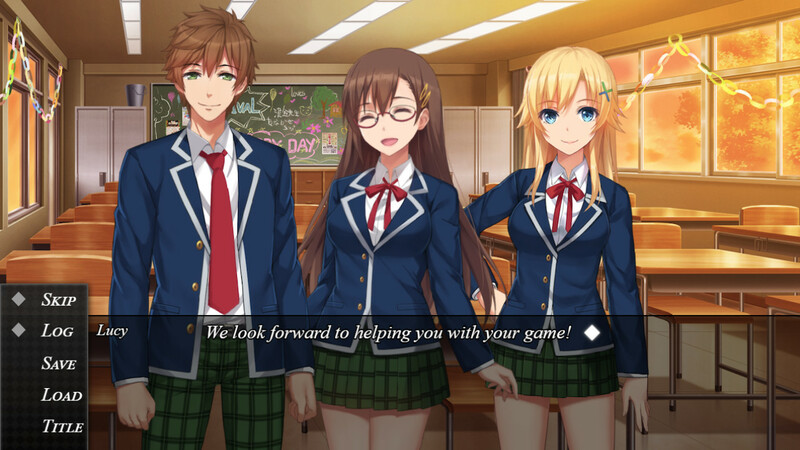 So, for example, if you want to make something like Love Plus, where you need to build up your relationship with the characters by answering their questions in the right way (to determine who you end up romancing by having the highest score with), the variable trackers for that kind of gameplay mechanic are very easy to implement. Later on, as you become more confident, you'll be able to experiment with the coding itself and further adjust the feature set of your visual novel. I'm not sure if you'd be able to push it as far as to make something like Danganronpa, but you just never know. 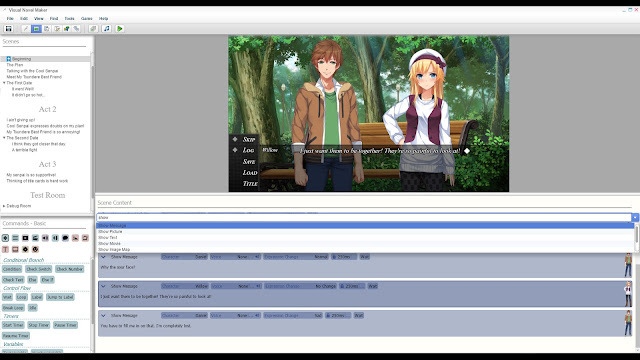 Overall, and as a first impression, Visual Novel Maker is definitely the kind of software for someone like me. Someone who likes visual novels enough to want to make one, but who lacks the time to learn how to handle one of the more complex engines, or to learn outright how to code. Hopefully by the time I review it in full I've really got to the point that I'm comfortable with it... and that would be a story in itself, given that it would have taken me two weeks, if that, to be ready to start producing commercial visual novels.